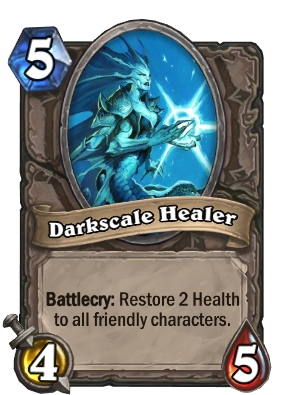 Battlecry: Restore 2 Health to all friendly characters. Healing is just something she does in her free time. It's more of a hobby really. yes, there is the north sea kraken, the naga sea witch, maybe others as well. Can be quite useful in handlock as a replacement for [card]Antique Healbot[/card]. Heals your minions to avoid Execute or aggro. A solid body and a fine ability. Seems best in priests where it can net you several cards. In priests it can occasionally let one of your other guys murder one of their and live to tell the tale with a healthy +4 health.